Today is a proud moment for Allen Christensen at the Brisbane Lions and it has nothing to do with a football field. Today the Club will launch its first Reconciliation Action Plan. The 26-year-old is a proud Indigenous man. He grew up in Lara, Victoria but his family are Tiwi people. Growing up his mother was a role model for him and his siblings. When she graduated in 2010 she was one of a handful of Indigenous lawyers practising in the state, while also raising five children. When Christensen was drafted by Geelong in 2009 he had a host of role models at the Club. Matthew Stokes and Travis Varcoe were names that first came to mind. “They were just always involved with the kids and there were a lot of Indigenous groups that came into the Club and toured the Club,” Christensen said. A trip he took to Gove, in the Northern Territory, with Geelong was life-changing. “Josh Walker and I actually went together there,” he said. “It was a pretty surreal experience and something different, but it opened my eyes to how much a kick with a kid or helping them get dinner, how much that helps them and how much they appreciate that. Allen Christensen, Cedric Cox and Charlie Cameron with Aboriginal artist Elaine Chambers who designed the Brisbane Lions' 2018 Sir Doug Nicholls Round guernsey. Christensen arrived at the Gabba in 2014 and played all 22 games for the Lions in the 2015 season. The following year, a collarbone injury in Round 11 ruled him out for the season. 2017 was no better, with a small crack in the plate of his collarbone sidelining him again for an entire season. “It probably took me until I pretty much got injured that I was able to see outside of football and what was going on,” he said. Christensen believed the relationship between the Club and the wider Indigenous community could be improved. “I don’t think we reached out to them and they didn’t reach out to us. I don’t think there was a lot of trust there,” he said. The Yerongpan Dancers during the Smoking Ceremony at the Gabba before Round 12. “To be able to slowly build that bridge, for now, I feel like the wider community would be happy to be able to say that they’re involved with the Lions,” Christensen said. For Christensen, the official nature of the paperwork presented today, which has been endorsed by Reconciliation Australia’s CEO Karen Mundine, demonstrates the Lions' ongoing commitment. “We’ve put all these things down on paper and it’s going to hold us to account. It’s going to allow us to engage more with everyone. It doesn’t matter if it’s big or small now. It’s on a document, so we are accountable,” Christensen said. Past players of Indigenous heritage including Chris Johnson, Darryl White and Ash McGrath will be at the Kangaroo Points Cliffs to witness the event. “Hopefully the guys can see that the Club is taking massive steps forward in that area,” Christensen said. 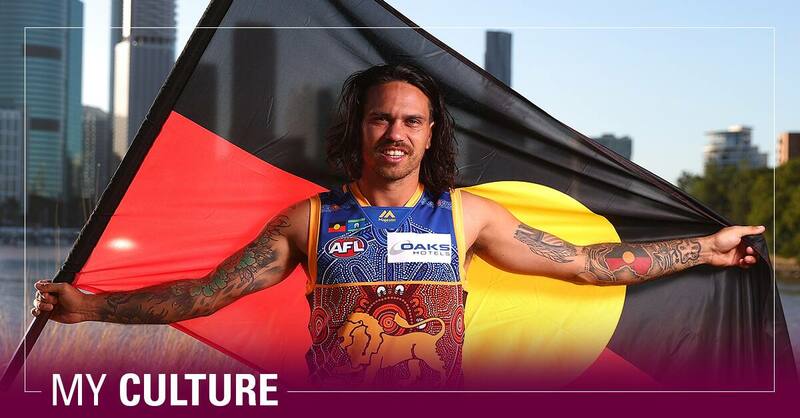 Joining them will be administration staff, coaches, players, members of the board, staff from AFL Queensland, staff from the Institute of Urban and Indigenous Health, Uncle Desmond, the Yeronpan dancers, media and members of Brisbane’s Indigenous community. “I think for it to keep succeeding, to be a long-term solution, it’s not just me, Charlie, Cedric and a few people upstairs, it’s got to be the whole Club buying in,” Christensen said.